PlaceIQ, a Boulder, Colo. location startup I wrote about earlier this year, just raised $4.2 million to build up its index of location profiles that can be used to better anonymously target ads to mobile users. The start-up raised the money from US Venture Partners, with Valhalla Partners joining existing investors IA Ventures, kbs+p Ventures. PlaceIQ is also relocating to New York City, to be closer to customers and partners. PlaceIQ is building an index of profiles on very specific geographic 100-meter tiles of the world. 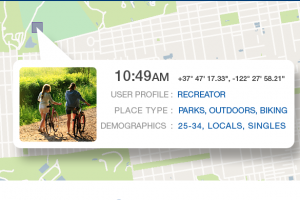 It takes publicly available data, from social information, tweets, and check-ins to cell phone density data, retail information, local events and points of interest and then applies machine learning and sentiment and pattern analysis to create a profile for a specific place that shifts over the course of the day to reflect what kind of people are there. This enables advertisers to better target mobile users and provide the most contextual and relevant ads based on where they are and what time of day it is. And it allows advertisers to target users anonymously without violating their privacy or tracking them individually. The start-up said it has helped a number of customers, including McDonald’s (s mcd) restaurants in one region, to better target their customers. One customer saw a 118-percent increased in click-through rates for their ads that used PlaceIQ. In addition to moving to New York, PlaceIQ plans to build out its team and product lineup and grow revenue through a number of markets. PlaceIQ raised $1 million earlier this year. As I mentioned before, location-based advertising is hot, with Nexage reporting a nearly 4x bump in ad impression rates for location-based ads. Location-based ads can be very powerful because they attempt to be very relevant to a user’s location. But with the concerns about privacy rising, tools like PlaceIQ can be a way to help push ads without running up against fears about privacy.